A decorative brick pattern used in brick paving and walls. The bricks are laid in alternating rows at 45 degrees to each other. More often used in paving work where large areas can be done quickly, when used in walls like shown here, there is an awful lot of cutting to be done. This type of decorative work came into fashion during the Tudor era. The buildings were typically made with large timber frames and the brickwork was not structural but in a small extent used to cut down the risk of fire and I guess to show the wealth of the owner. Both of these example are original, the top one being near Lincoln's Inn in London and the one below in the centre of Canterbury near the Cathedral. 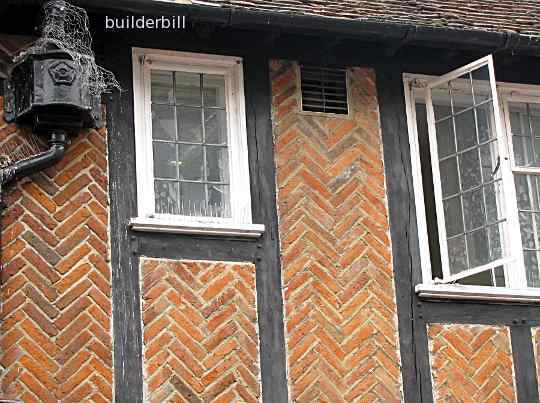 Looking at this photo it is easy to see that this pattern can use any size of bricks, for walls with a 10mm joint, or for paving with no joint.